Applies vertical perspective correction to an angular panoramic image. 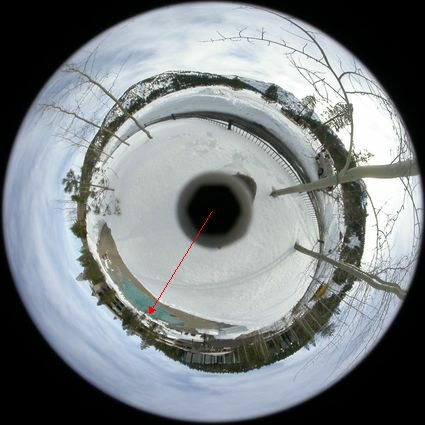 DESCRIPTION: PANO2RECT applies vertical perspective correction to an angular panoramic image. The output formats are either tilt or leve. These describe only the vertical format for the output image. The horizontal format will not be changed. For tilt format, the output will be a tilted view with the look direction towards the mid row of the input panoramic image. For level format, the perspective will be looking horizontally. -v vtop,vbot ... VTOP,VBOT are the vertical viewing angles at the top and bottom of the input panorama image. The default is 90,0 which corresponds to a 90 degree vertical range of view, i.e. zenith to horizon. -p pfov ... PFOV is the vertical output perspective image field of view in degrees. Values are floats in the range 0<pfov<180. 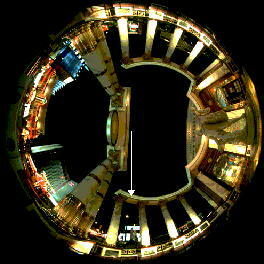 The default is to use the vertical viewing range of the fisheye image, which is vrange = (vrad-vcen) = ifov/2 (half of the field of view across the circular diameter). The amount of input image in the output perspective image will depend upon the pfov parameter. Note that in comparison, a value of 27 degrees corresponds to a vertical field of view from a 35 mm camera (film size 36mm x 24mm) with a 50mm focal length lens, i.e. a "normal" view. -f format ... FORMAT is the output image perspective format. The choices are: tilt (T) and level (L). The default is tilt. If tilt (T) is chosen, then the output image will have perspective correction applied in the vertical direction and the image will be centered by default about the mid-angle of the panorama image, i.e., vertical center of the panorama. In other words a tilted vertical perspective will be produced. If level (L) is chosen, then the output image will also have perspective correction applied in the vertical direction. But the view will be one that is not tilted, but looking horizontally. The horizon line will default to the bottom of the output image (assuming that the top row of the panorama image is looking above the horizon). -i iyc ... IYC is the pixel coordinates in the input panorama image that will be the center of the perspective correction. The default is the center row of the panorama image. Values are non-negative floats. -o oyc ... OYC is the pixel coordinates in the output perspective image that will be the center of the perspective correction. The default is the center row of the perspective image for format=tilt and the bottom row of the perspective image for format=level (assuming that the top row of the panorama image is looking above the horizon). Values are non-negative floats. -h height ... HEIGHT is the desired height of the perspective image. The default is the same as the input. Values larger than the input may be useful in showing more of the image when a level perspective is used. Values other than the default will not change the scale of the perspective image in the vertical dimension. They will only allow more (or less) data to be viewed. -vp vpmethod ... VPMETHOD is the virtual-pixel method. Any valid IM virtual-pixel setting is allowed. The default is black. with a tilt perspective correction.